A Lemon Pudding (55) Two penny loaves grated fine, the rind of one lemon, the yolks of Six eggs and the whites of four, two Spoonsful of Rose water and Six Spoonsful of Brandy, half a nutmeg half a pound of fine Sugar, mix them all well together Set it over a fire for a quarter of an hour, lay in puff paste, at the bottom and round the edge of your dish. It will take an hour to bake it. 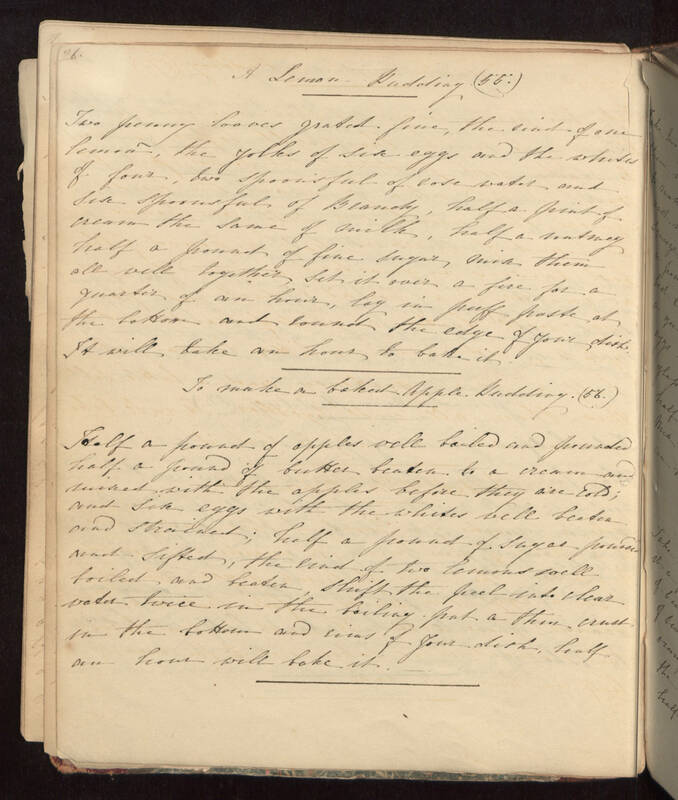 To make a baked Apple Pudding (56) Half a pound of apples well boiled and pounded half a pound of butter beaten to a cream and mixed with the apples before they are cold; and Six eggs with the whites well beaten and strained; half a pound of Sugar pounded and Sifted, the rind of two lemons well boiled, and beaten, Shift the peel into clear water twice in the boiling. put a thin crust in the bottom and rims of your dish, half an hour will bake it.